By Cindy Schaarschmidt, Study Tour Leader (University of Washington, Tacoma) and Daniel Villanueva, Co-Leader (University of Nevada, Reno). First, we definitely want to thank all 19 NAFAns who took time out of their summer work or vacation schedules to come along! Your energy, your questions, and your camaraderie were wonderful! It was our pleasure leading the tour with such engaged and dedicated colleagues. “Virtual” gift bags to you all! Thank you as well to those who organized our wonderful accommodations, punctual and safe transportation, knowledgeable on-site guides, and informative guest speakers. The behind-the-scenes work of the following people deserves a huge round of online applause: Reiner Rohr and Kerstin Klopp-Koch from the German-American Fulbright Commission, and Ulrike Maehring, Maria Horschig, and Michaela Gottschling from DAAD. Of course, we also thank the many representatives and current scholarship recipients of all the funding organizations, universities, research institutes, and the German Parliament who opened their doors to us so willingly and shared the many benefits of scholarship and work opportunities in Germany with our group. Even those of us with prior experience in the German university system or who have received competitive fellowships to Germany in the past learned a lot on the Study Tour. One of the most important things we did discover is that each German university, funding organization, and research site we visited had multiple, distinct opportunities tailored to specific sub-populations of students and researchers. So, as six days was scarcely enough time to scratch the surface of such options and there is still so much to learn, we have requested that a special area in the NAFA Forum online be created. This will be a repository for all NAFA members to view documents and presentations by various representatives we visited. NAFAns with questions about specific scholarships or study and research opportunities will also be able to post questions and share answers about everything from suggesting the ideal scholarships to specific students, to helping them through the application and selection process. Look for an announcement about the NAFA Forum German category via the members’ listserv in the not-too-distant future! In the meantime, “Auf Wiedersehen” from us both, and see you in Philadelphia in 2017! Author scheinandseinPosted on July 5, 2016 July 5, 2016 Leave a comment on Danke und auf Wiedersehen! Hello NAFAns! On Friday, July 1, we had an informative visit to the Helmholtz-Zentrum Dresden-Rossendorf (HZDR), one of the 18 Helmholtz Centres across Germany. These foster interdisciplinary basic research in six major research areas: energy, matter, earth and environment, health (especially cancer research), aeronautics and transport, and key technologies (including super computing and materials science). A highlight of this last day of our trip was that most, if not all, those we met had worked extensively in both the United States and Germany. Among our speakers were Prof. Dr. Roland Sauerbrey, HZDR’s Scientific Director, Prof. Dr. Thomas E. Cowan, Director of the Institute of Radiation Physics, PD Dr habil Arthur Erbe, Division Head of Scaling Phenomena in the Institute of Ion Beam Physics and Materials Research, and Dr. Kay Potzger, Initiator of HZDR’s Summer School Program. We also heard from a junior researchers, a PhD student, and a DAAD RISE Intern. The HZDR was founded in 1992 and focuses on energy, health, and matter. How can energy and resources be used efficiently/safely? How can malignant tumors be visualized, characterized, treated? Its facilities include a high-magnetic field lab, an ion beam center, and a center for high-power radiation sources (ELBE Center). Covering HZDR walls are posters detailing research contributions of its scientists. The pride and joy of HZDR, the Ion Beam Center. An HZDR researcher explaining magnetism experiments, with a DAAD RISE recipient (seated) assisting. 1) The advantages of being a researcher in Germany, from the vantage point of an American expatriate. Prof. Dr. Cowan noted government funding for basic scientific research is not as compartmentalized in Germany as it is in the U.S., and that this quality encourages ambitious, multidisciplinary initiatives. He noted a great deal of collaboration and sharing of resources between the various Helmholtz Centers and associated their consensus-building with a continuity of support for major projects (of up to 10-15 years), once funded. 2) Special resources that HZDR offers to international students. HZDR has asummer program distinct from DAAD RISE, intended for students who hold a Bachelor’s degree by the start of the program. Roughly 10 candidates are selected and their stipend covers accommodations and living expenses, but not transportation to and from Dresden. Recipients are fully integrated into research groups. They attend tutorial lectures, present their research results, and take part in social events and excursions. 3) Helmholtz’s support for talented young researchers. HZDR is home to eight junior researchers’ groups. We heard from Dr. Dominik Kraus, recipient of a prestigious Helmholtz Young Investigators Award and the leader of one such group. Recipients get 300,000 Euros/year for up to 5 years. This award also provides the group leader with tailored training and mentoring. It is intended to smooth the path to becoming a professor, a highly competitive process that is regulated by law in each German state. Dr. Artur Erbe of the Institute of Ion Beam Physics and Materials Research also talked about the support structures provided through the newInternational Helmholtz Research School for Nanoelectronics Networks(NanoNet) to “build electronics of the future.” The program provides two years of courses, one general and one specialized. Dr. Erbe informed us that students are provided with a blend of academic courses, tutorials, training on transferable skills, and support for conference travel and student conferences. After a very informative tour of the HZDR facilities, our group was driven back to the center of Dresden for lunch and a walking tour of the city center led by an art historian (pictures below.) After that tour, our group said a series of goodbyes – some left immediately for points elsewhere in Germany, some went to bed early because of early flights or trains to catch the next day, and a few enjoyed a last Biergarten evening next to the Elbe River opposite Dresden’s Baroque skyline. Safe onward and homeward travels, all!! The “Zwinger,” a museum complex. The Church of Our Lady (Frauenkirche), destroyed in 1945 and rebuilt in 2003. Our guide at the “Fürstenzug,” illustrating the “Parade of Elector-Kings” of Saxony from 1153 to the late 1800’s. 1) The Technical University of Dresden (TU-Dresden) is an outstanding, world-class institution that your science students should definitely have on their radar. Opened in 1828 and largely destroyed in WWII, TU-Dresden was rebuilt in the post-war period, reinvented in the post-Cold War period, and has enjoyed much success since then. In 2012, it was named as one of the 11 “Universities of Excellence” by the German Research Foundation (DFG) and the German Science Council (DWR) (becoming the only former East German institution outside of Berlin to receive this designation), in 2014 the THE listed it as the 135th-ranked university in the world, and it has steadily increased its ranking in research funding from the German equivalent of the NSF (DFG) in the last two decades, now standing as the 10th-ranked institution. TU-Dresden is bold about its future, with a stated goal of being one of the top 100 global universities in the coming decade. 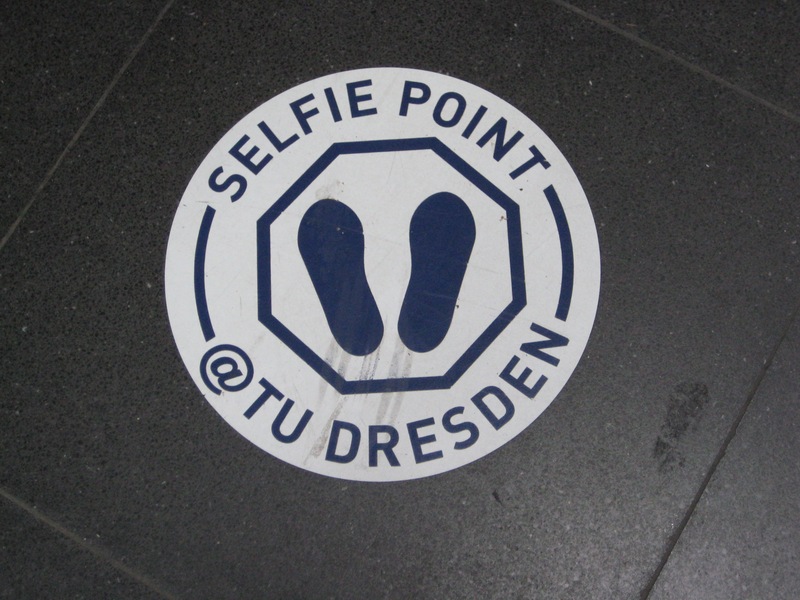 TU-Dresden currently enrolls around 36,000 students, 15% of whom are from 125 other countries. These students, which include 3,500 doctoral candidates, study in 125 different programs, organized in 14 faculties in 5 schools: Engineering Sciences, Science, Medicine, Civil & Environmental Engineering, and Humanities & Social Sciences. About 2/3 of all students are in one of the four science divisions, and a healthy number of the humanities & social science students are in teacher training programs. 2) The Fachhochschule (universities of applied sciences) provide excellent practical training for scientists who do not aspire to research careers, and are as eager as all other insitutions of higher education to internationalize their student experiences. We spent the afternoon at the University of Applied Sciences Dresden (Hochschule für Technik und Wirtschaft (HTW) Dresden), where we had an excellent introduction to the applied science model that we had heard about at varying points this week. The Fachhochschule offer a more practice-oriented structure, often times in much smaller educational settings; for example, the school we visited today is 1/7 of the size of TU-Dresden, with only 5,100 total students. The academic pathways are also sometimes clearer than they are at the more traditional universities (we spent considerable time this morning understanding the differences between the independent and structured PhD pathways at more traditional universities; it is also worth noting that only those universities can offer PhDs). The Fachhochschule are also more likely to build strong ties to small- and medium-sized businesses in the area near the school, especially since students are likely to attend the Fachhochschule nearest where they grew up. I was surprised to learn, for example, that this school goes so far as to have local businesses help design courses of study to ensure that they are meeting the businesses’ needs appropriately. This is, we were told, “education to work after study,” and often includes hands-on, practically-focused work; we were told that the vehicle engineering program, for example, includes a partnership with Porsche. 3) The DAAD RISE summer internships are as good as advertised. We were joined at dinner tonight by six US students who were conducting research in Dresden this summer. I was lucky enough to sit with two of them, from Clemson University (she says hi, Ricki!) and Wesleyan College (a women’s college in Georgia, not to be confused with its similarly-named counterpart in Connecticut), both of whom are working in a lab at TU-Dresden for the summer. They absolutely raved about the experience, from the two weeks of language training at the start, to the experiences living and working abroad, to the depth of the scientific research that they have plunged into. As advisors, we always hope that the experiences we help our students achieve will live up to the lofty expectations we all have for them, and it appears that DAAD RISE easily clears that high bar. 4) Everything closes at 6pm in downtown Dresden. 5) I really don’t like Ronaldo. 6) The drive from Leipzig to Dresden is lovely; Kim Germain and I spotted a deer! 7) Hares are enormous. Startlingly so. 8) Dana Kuchem does not look in the background when taking selfies and is stunningly easy to photobomb. That’s where we had dinner. We made it into the online magazine of the Martin Luther University Halle Wittenberg. Check it out at this link. Leipzig University (LU) is the second oldest university in Germany – founded in 1409. There are 14 faculties (or schools), 154 study programs and 29,227 students including 3,570 international students representing 120 countries. There are a number of degree programs taught in English both at the bachelor’s and master’s degree levels. It seems that more universities are looking for collaborations within Germany and internationally. We heard about the German Centre for Integrative Biodiversity Research (iDiv) Halle-Jena-Leipzig and about theAmerican Studies and German-American Institute for Transcultural Studies (GAITS). The American Studies program is taught in English at both the BA and MA levels. While students get tuition fees paid by German taxpayers, there are also a few scholarships available to students, namely Fulbright, DAAD, Erasmus +, and political foundations such as the Konrad Adenauer, Friedrich Ebert, (info only in German) Heinrich Böll, Friedrich Naumann, Hanns Seidel orRosa Luxemburg Foundations to cover other expenses. Some foundation funding applications are open to US or non-EU but not all. Checkwww.study-in.de and www.daad.de for scholarship databases. Our second visit of the day was to the Max Planck Institute for Social Anthropology, approximately 1 hour northwest of Leipzig. This particularMax Planck Institute (MPI) was created in 1999. Today at the MPI in Halle there are 45 researchers and 95 PhD students who participate in research in three main areas: Financialization Group (focus on East Europe/Eurasia); Legal Anthropology; and Political Anthropology Integration and Conflict. One cannot earn a degree in Germany through an MPI; it must be conferred by a German university. Several of the MOI researchers are honorary professors connected to the Universities of Halle and Jena. MPIs are funded by public money (taxpayers) with a generous budget, and the working language is English. Our third visit was to the Martin Luther University Halle-Wittenberg (MLU). MLU Halle-Wittenberg offers a wide range of disciplines for bachelor, master, and doctoral degrees – Humanities, Sciences, Medicine and more, except Engineering. In addition, there are a few degree programs taught in English. Today there are 20,000 students with approximately 2,000 international students including 21 students from the U.S.
Like other German universities, MLU does not charge tuition. However, international students who are non-EU citizens and who do not have scholarship support, have to show that they have 8,000 EUR in a blocked bank account to enroll in a degree program. If a student is on a scholarship or from within the EU they do not have to show this proof financial support. Similar to University of Leipzig, the International Office at MLU Halle-Wittenberg offers orientation programs to help the international students get settled in, language classes, tandem language buddies with German students, and many more services to support international students. Both Leipzig University and MLU Halle-Wittenberg receive special funding from DAAD to support international PhD students through programs, events, workshops and excursions around Germany. LU has a program called International PhD Students Initiative (Internationale Doktoranden Inititiative), and at MLU it is called PhD Network. 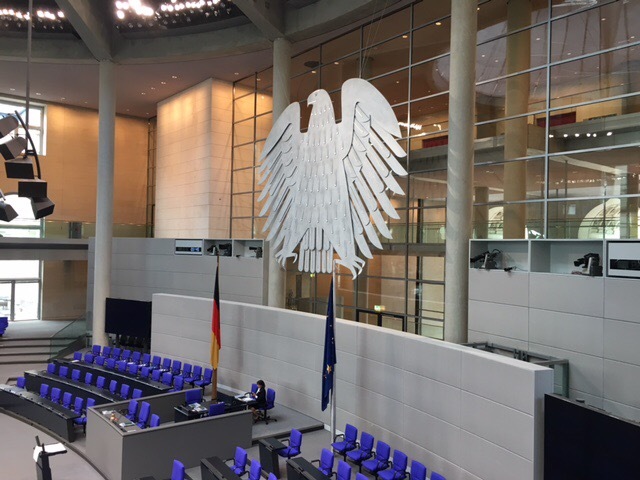 We visited the Deutscher Bundestag for a tour and a few discussions relevant to transatlantic understanding and exchange opportunities for our advisees. The guide offered us an overview of historical significance of the stunning building, and explained why walls were covered in Russian scribbles. In addition to a slew of tourists and young groups of students, there were plenty of official-looking folks and people from the press. It turns out that a last minute parliament session was ordered before the end of the season, concerning Germany’s take on Britain’s vote to leave the EU. We spent a few minutes in the plenary chamber but had to exit before the session started. Next, we heard a presentation by Henning Speck, the Chief of Staff of theCoordinator of Transatlantic Cooperation at the German Foreign Ministry. He described the US and German relationship as being more dense and intense than ever, and stressed the importance of maintaining, strengthening and broadening the base of this connection. Speck noted that his unit is concerned with finding innovative ways to engage younger generations and new parts of society (especially minorities and populations outside of Berlin and the US East Coast) in this transatlantic relationship, not only so that it will persist far into the future, but because it is integral to peace maintenance and international order. Our discussion of transatlantic relations continued as we learned about an array of exchange programs. 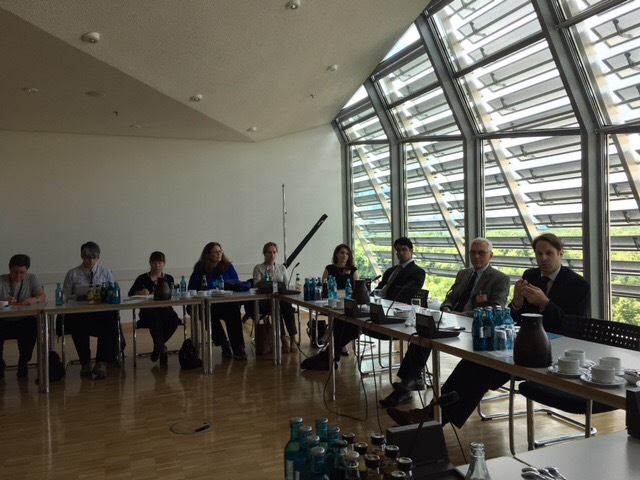 Sybille Koch, Head of International Exchange Programs and Bartholomäus Kalb, member of the German Parliament, gave us an overview of the International Parliamentary Scholarship (IPS) and the Congress Bundestag Youth Exchange Program (CBYX-PPP). CBYX-PPP is a year-long program for people who are 18-24 years old and interested in completing a semester at a German university, and practical training with a German company; German language skills aren’t required although some work experience is preferred. IPS (in German only) is open to people under the age of 30 and places participants in positions at the parliament. IPS requires a solid foundation in German and a university degree. One alumna and a current fellow from IPS stopped by to rave about the program’s impact on their German language, intercultural and professional abilities; the alumna also shared that IPS played a pivotal role in preparing her for her upcoming position as a Foreign Service Officer. Leipzig, a city of music and protest, is stunning. Our tour guide walked us through the streets of the center, pointing out music houses and former monastery grounds, while sharing (mostly heartbreaking) stories about Goethe, Bach, Wagner, Schumann, and others who survived various amounts of time in here. We saw St. Nikolaus Church, where the Monday Demonstrations began with a small group of discontent locals and eventually grew to over 70,000 East German protesters demanding the ability to travel outside of East Germany and elect a new government. This movement led to the fall of the Berlin Wall. There is some debate about the meaning of the name Leipzig. 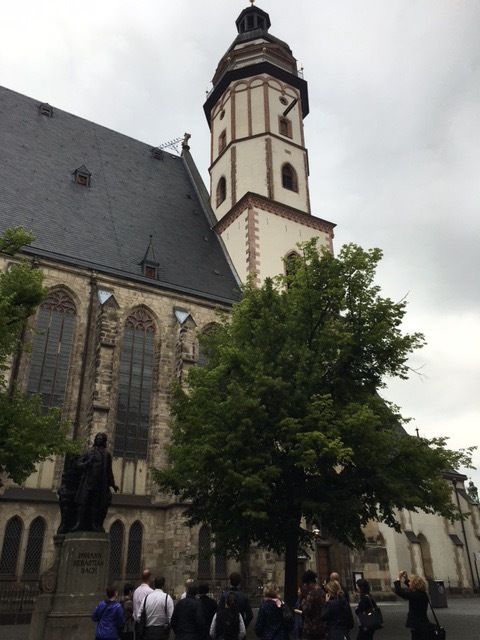 The guide shared that Leipzig is often thought to come from a Slavic term for home of the Linden trees, but that some researchers say it that it derives from a term that would suggest it is the city of dirty water. “Der Tropfen, der das Fass zum Überlaufen bringt.” It means something like the drop that makes the barrel overflow, but is better translated as the straw that breaks the camel’s back. Our guide taught us this as we visited an overflowing monument of revolution. Visit germany.info to get more information about exchange options, scholarships and fellowship opportunities for your advisees. So far everyone who has met with us has expressed an interest in seeing more applications from our students. Today we dove straight into big issues related to studying in Germany, including the German system of education, the student experience, and various fellowship opportunities. 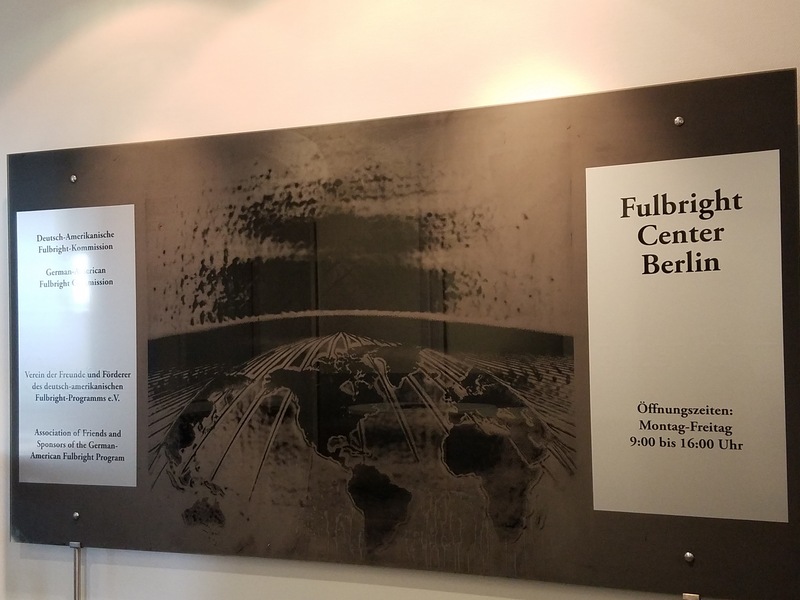 We spent the first half of the day at the German-American Fulbright Commission, which was a particularly appropriate first destination given that some 25% of all American Fulbright Student Program grantees end up in Berlin. In addition to members of the Fulbright Commission staff, our presenters included four recent or current Fulbright students. In the afternoon, we met at WissenschaftsForum Berlin with presentations fromDAAD, Cultural Vistas, the Hochschulrektorenkonferenz, and theAlexander-von-Humboldt Foundation. Each representative provided us with a wealth of information both on full degree programs available in Germany as well as specific scholarships and fellowships for students from sophomore year through advanced postdoctoral and professional levels. The German system of higher education was covered by many of our presenters, and I think the group started to get a good sense of the very complex and different situation here by the end of the day; suffice it to say that having good contacts with these organizations and host institutions and their international offices is essentially for any student interested in studying in Germany. Free tuition and the increasing number of international masters programs taught in English draw a lot of students to Germany; Germany sees offering these programs as an investment in its own future and its internationalization. From the student perspective, a central take-away for us is that the German university system expects students to be very self-motivated and focused. Many courses have no participation requirement, and what little homework there is tends to be very self-directed. The course grade will generally be based on just one or two assignments or papers. This is great for students who want independence and the ability to tailor their educational experiences. The students who met with us all seemed to have adjusted very well to this system and enjoyed their experiences, while stressing that one does need to be ready to accept a different university experience than in the USA, particularly the student-services aspects. We were all very impressed with the wide range of funding opportunities for students interested in studying and/or working in Germany. The foundation representatives we met with discussed funding for students from the sophomore level through post docs and faculty (see links!). Unfortunately a blog post can’t possibly cover all of these in detail. One resource I would like to highlight is the Hochschulrektorenkonferenz (HRK), the German Rectors’ Conference, which bills itself as the voice of the universities; the HRK has a higher education compass website to help students find appropriate programs as well as a research explorer website that allows universities to highlight their research priorities. To start with, however, both students and advanced scholars can log on to study-in.defor a lot of useful general information. Overall, I think we came away from the day with the sense that there is a lot going on in Germany and we are sure to learn a lot here in the coming days! Today was the first day of the Germany Study Tour and we began with a bus tour of Berlin, with a wonderful guide who gave us a brief glimpse into Berlin’s long history as the seat of the Prussian Empire, as exemplified by the Schloss Charlottenborg, a castle built in 1699 for Queen Sophia Charlotte, the wife of Frederich I, to Berlin’s present day federal government exemplified by the Bundestag, where the German Parliament meets. We passed by several of Berlin’s famed universities – Technical University of Berlin (Technische Universität Berlin) and Humboldt University which has 29 Nobel Prize winners among its faculty and alumni, including Einstein and Heisenberg. There are over 176,000 university students in Berlin, making it an exciting place for your students to consider for study abroad opportunities. 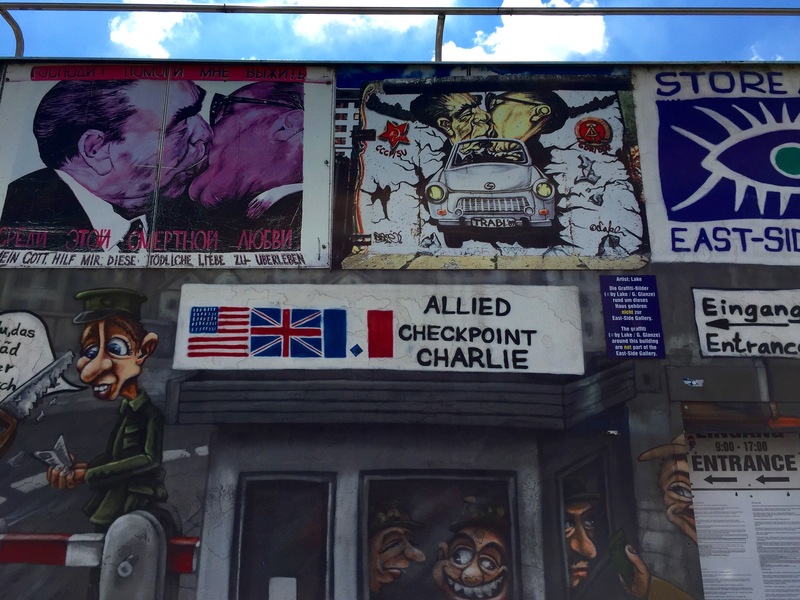 We were fortunate to have a few minutes to stop at the East Side Gallery to see the longest remaining section of the Berlin Wall. Our guide reminded us that construction on the Berlin Wall began in 1961, and that it fell in 1989. 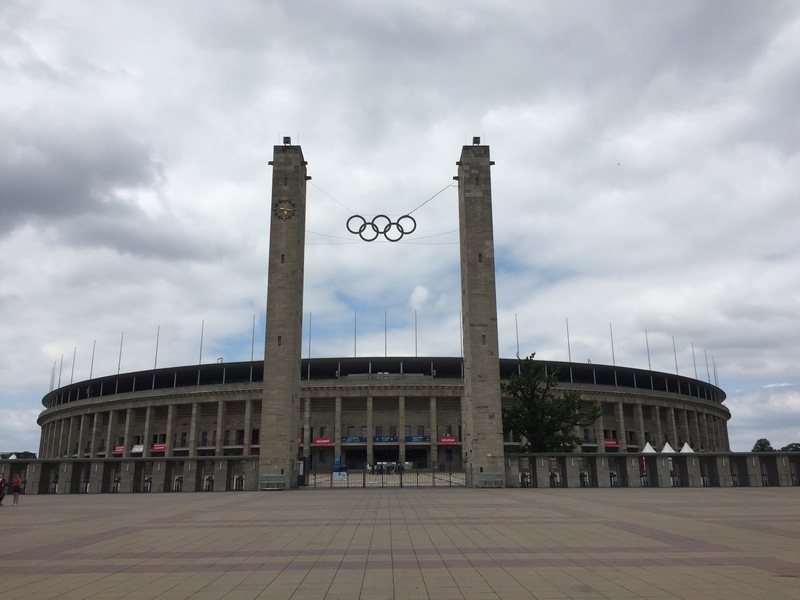 We also had the opportunity to see the stadium where the 1936 OlympicGames were held and to be reminded of the impact of Jesse Owens, the African American athlete who won four gold medals at those Olympics. We concluded our tour with lunch at a restaurant and beer garden, with a view looking out on the river. Of course, you can trust that NAFAns did some personal testing of the local beer and cheered on Germany as they defeated Slovakia in soccer. Now we are all ready for our full day with the German Fulbright Commission and representatives from German universities tomorrow. 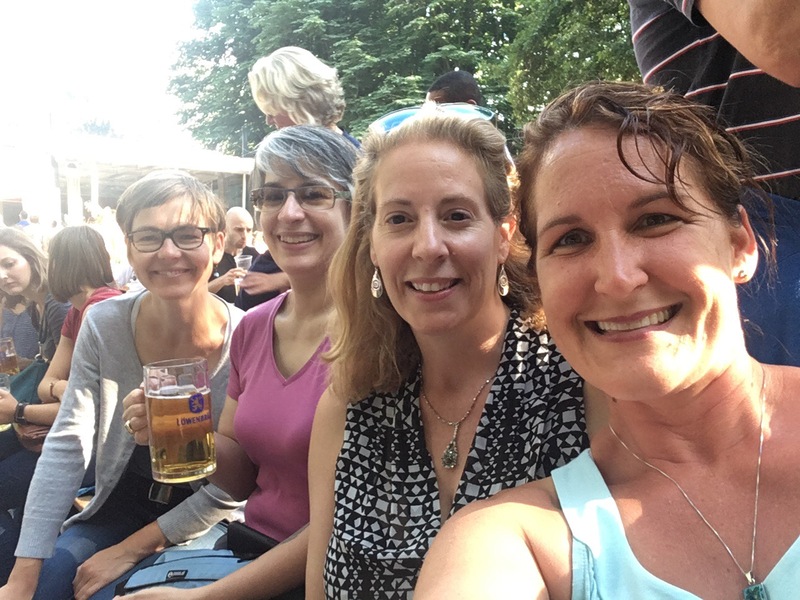 We’re excited for our upcoming NAFA study tour to Germany: We will be visiting Berlin, Leipzig, Halle, and Dresden from June 25-July 2. Many thanks to the German-American Fulbright Commission and the DAAD (German Academic Exchange Service) for hosting us. Look here for photos and important updates as we travel. 19 members of the National Association of Fellowships Advisors (NAFA) are traveling to Germany June 25-July 2, 2016. We’re hosted by the German-American Fulbright Commission and the DAAD (German Academic Exchange Service) and will be visiting Berlin, Leipzig, Halle, and Dresden. 2) Special resources that HZDR offers to international students. HZDR has a summer program distinct from DAAD RISE, intended for students who hold a Bachelor’s degree by the start of the program. Roughly 10 candidates are selected and their stipend covers accommodations and living expenses, but not transportation to and from Dresden. Recipients are fully integrated into research groups. They attend tutorial lectures, present their research results, and take part in social events and excursions. 3) Helmholtz’s support for talented young researchers. HZDR is home to eight junior researchers’ groups. We heard from Dr. Dominik Kraus, recipient of a prestigious Helmholtz Young Investigators Award and the leader of one such group. Recipients get 300,000 Euros/year for up to 5 years. This award also provides the group leader with tailored training and mentoring. It is intended to smooth the path to becoming a professor, a highly competitive process that is regulated by law in each German state. Dr. Artur Erbe of the Institute of Ion Beam Physics and Materials Research also talked about the support structures provided through the new International Helmholtz Research School for Nanoelectronics Networks (NanoNet) to “build electronics of the future.” The program provides two years of courses, one general and one specialized. Dr. Erbe informed us that students are provided with a blend of academic courses, tutorials, training on transferable skills, and support for conference travel and student conferences. It seems that more universities are looking for collaborations within Germany and internationally. 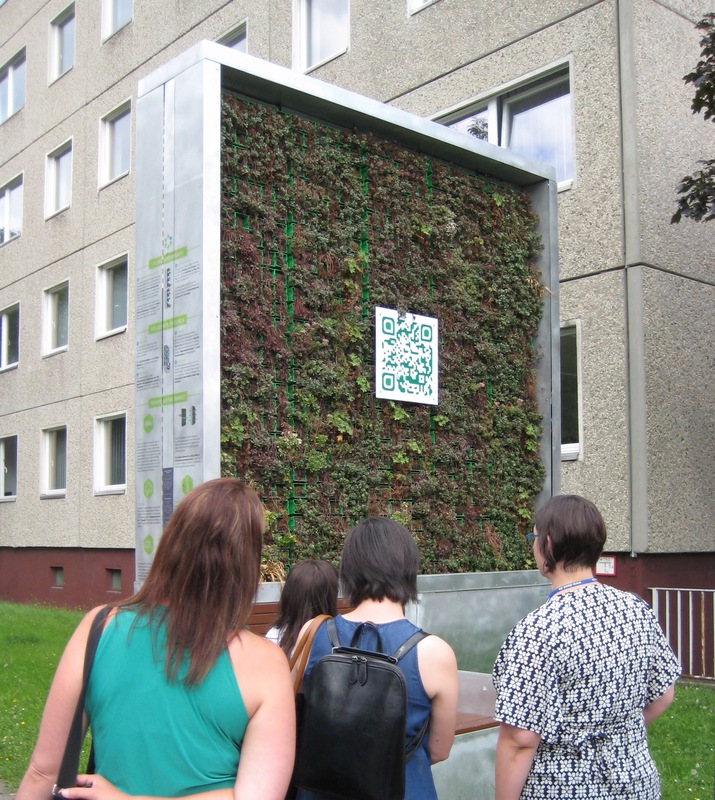 We heard about the German Centre for Integrative Biodiversity Research (iDiv) Halle-Jena-Leipzig and about the American Studies and German-American Institute for Transcultural Studies (GAITS). The American Studies program is taught in English at both the BA and MA levels. While students get tuition fees paid by German taxpayers, there are also a few scholarships available to students, namely Fulbright, DAAD, Erasmus +, and political foundations such as the Konrad Adenauer, Friedrich Ebert, (info only in German) Heinrich Böll, Friedrich Naumann, Hanns Seidel or Rosa Luxemburg Foundations to cover other expenses. Some foundation funding applications are open to US or non-EU but not all. Check www.study-in.de and www.daad.de for scholarship databases. Our second visit of the day was to the Max Planck Institute for Social Anthropology, approximately 1 hour northwest of Leipzig. This particular Max Planck Institute (MPI) was created in 1999. Today at the MPI in Halle there are 45 researchers and 95 PhD students who participate in research in three main areas: Financialization Group (focus on East Europe/Eurasia); Legal Anthropology; and Political Anthropology Integration and Conflict. By Sheena Daree Miller (University of Vermont). Next, we heard a presentation by Henning Speck, the Chief of Staff of the Coordinator of Transatlantic Cooperation at the German Foreign Ministry. He described the US and German relationship as being more dense and intense than ever, and stressed the importance of maintaining, strengthening and broadening the base of this connection. Speck noted that his unit is concerned with finding innovative ways to engage younger generations and new parts of society (especially minorities and populations outside of Berlin and the US East Coast) in this transatlantic relationship, not only so that it will persist far into the future, but because it is integral to peace maintenance and international order. We spent the first half of the day at the German-American Fulbright Commission, which was a particularly appropriate first destination given that some 25% of all American Fulbright Student Program grantees end up in Berlin. In addition to members of the Fulbright Commission staff, our presenters included four recent or current Fulbright students. 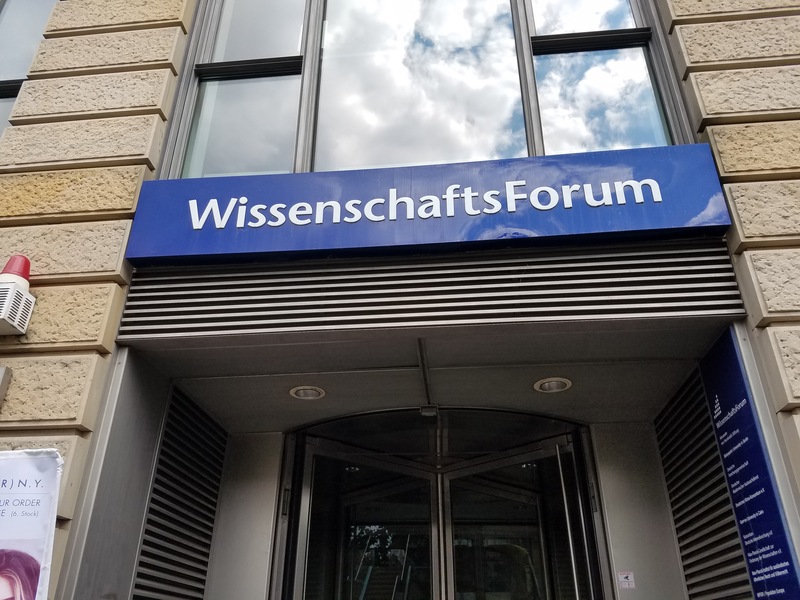 In the afternoon, we met at WissenschaftsForum Berlin with presentations from DAAD, Cultural Vistas, the Hochschulrektorenkonferenz, and the Alexander-von-Humboldt Foundation. 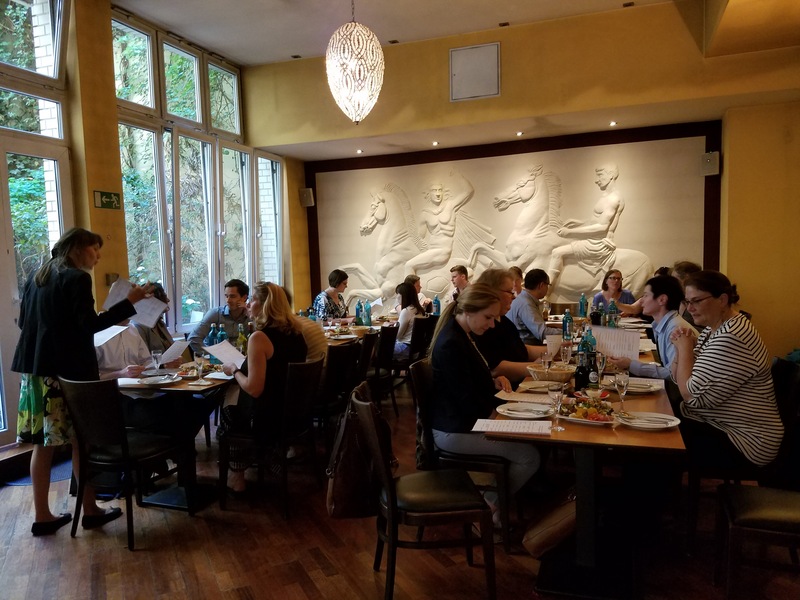 Each representative provided us with a wealth of information both on full degree programs available in Germany as well as specific scholarships and fellowships for students from sophomore year through advanced postdoctoral and professional levels. We were all very impressed with the wide range of funding opportunities for students interested in studying and/or working in Germany. The foundation representatives we met with discussed funding for students from the sophomore level through post docs and faculty (see links!). Unfortunately a blog post can’t possibly cover all of these in detail. One resource I would like to highlight is the Hochschulrektorenkonferenz (HRK), the German Rectors’ Conference, which bills itself as the voice of the universities; the HRK has a higher education compass website to help students find appropriate programs as well as a research explorer website that allows universities to highlight their research priorities. To start with, however, both students and advanced scholars can log on to study-in.de for a lot of useful general information. Author scheinandseinPosted on June 27, 2016 June 29, 2016 1 Comment on And we’re off! Author germany2016nafaPosted on June 1, 2016 June 26, 2016 1 Comment on Herzlich Willkommen! 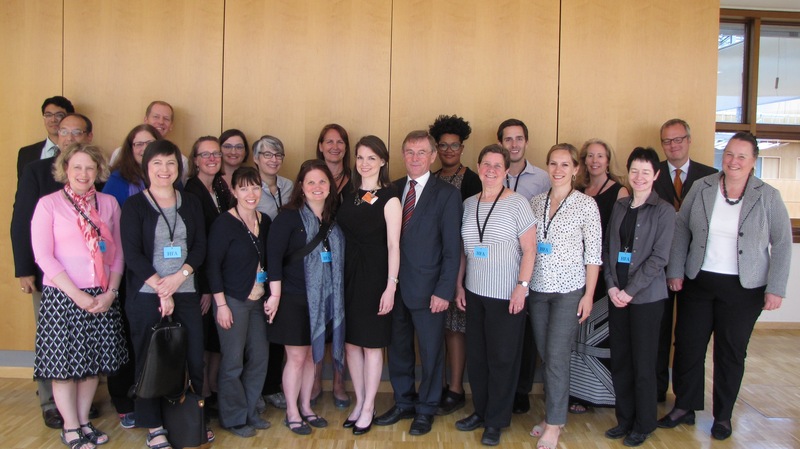 19 members of the National Association of Fellowships Advisors (NAFA) are traveling to Germany June 25-July 2, 2016. We're hosted by the German-American Fulbright Commission and the DAAD (German Academic Exchange Service) and will be visiting Berlin, Leipzig, Halle, and Dresden. 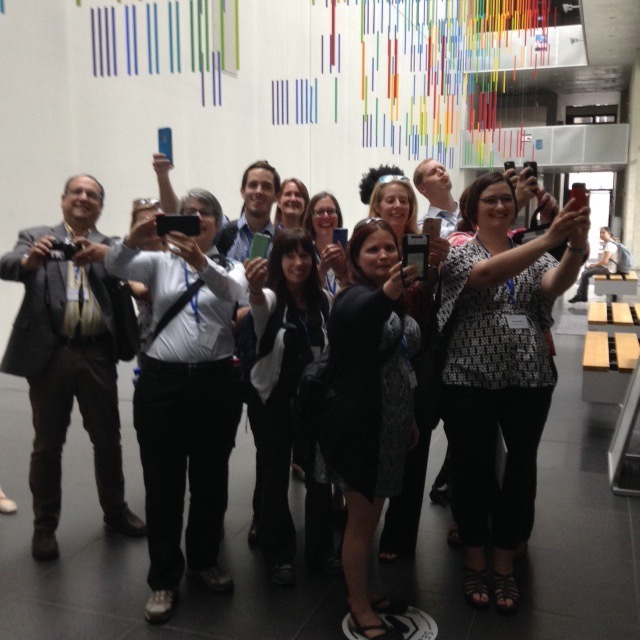 NAFA Germany Tour 2016 Create a free website or blog at WordPress.com.